Le previsioni dicono sole e noi siamo più che contenti perché domenica 01 marzo vi vogliamo incontrare per una passeggiata. Incontro al bivio per il paese di Gerfalco ("all'incasso") alle ore 9:30. Il percorso dista circa 5km e andremo verso il Poggio di Montieri per poi scendere al biotopo "Il Laghetto di Montieri," facendo un anello per ritornare alle nostre macchine verso le 11:30. Euro 2 a persona sopra i 15 anni. Portate il binocolo, acqua, scarpe da trekking e vestiteVi per la stagione (che vi posso dire è bella!) A domenica! The weather forecast is good and that pleases us to no end because Sunday March 1st we would like you to join us for another walk as part of the initiative Fuori Ci Aspetta (The Outdoors Awaits Us). Meeting point at the intersection for the village Gerfalco at 9:30. We've got about 5km to walk, heading first towards the Poggio di Montieri (the hill in whose shadow Montieri was built) and then down towards a biotope lake known as Laghetto di Montieri, completing a loop that will bring us back to our vehicles around 11:30. Minimal cost of 2 euros per person over 15 years old. Bring binoculars, water, hiking boots and dress for the weather (which we can assure is quite nice considering it's March!). See you on Sunday. Segnate nel calendario il primo appuntamento di Fuori Ci Aspetta! 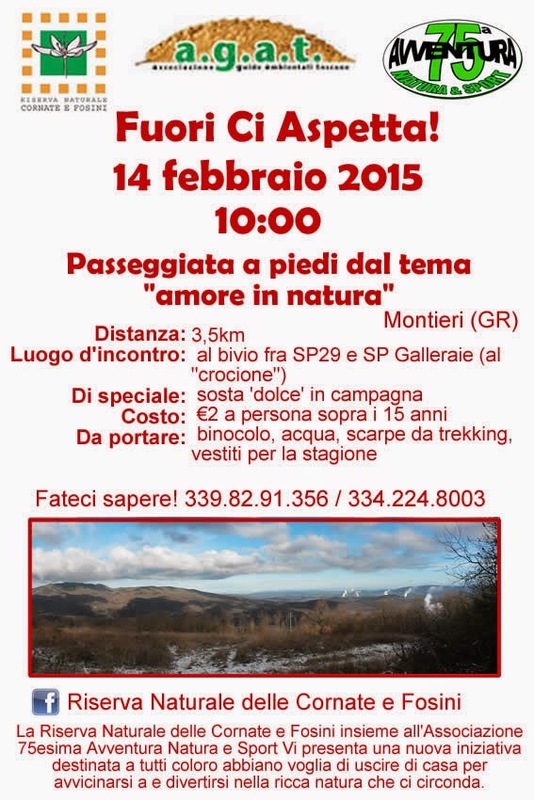 Sabato 14 febbraio 2015 alle ore 10:00 incontriamoci ad un bivio vicino al paese di Montieri (GR) per una passeggiata a piedi dal tema "amore in natura." Una distanza non troppo faticosa, solo 3,5km fra i boschi delle Colline Metallifere. Ad un certo punto vi troverete a fare una sosta 'dolce' in campagna che sicuramente sarà molto gradita ai bambini, quindi venite come una famiglia intera e passare una oretta o due insieme all'aria aperta. Costo Euro 2 a persona - sotto i 15 anni gratis! Portare binocolo, acqua, scarpe da trekking, vestiti per la stagione e la macchina fotografica; il panorama vi meraviglierà. Write it down in your calendar! 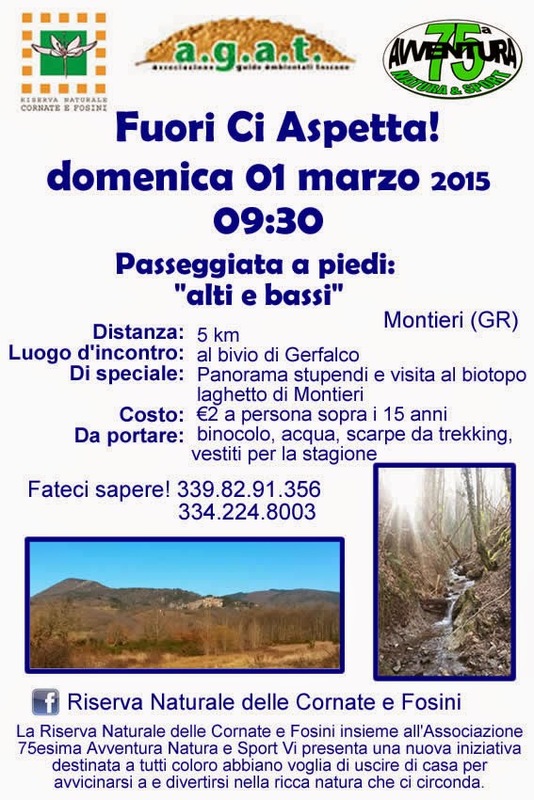 The first meeting of "Fuori Ci Aspetta" (The Outdoors Awaits Us) is scheduled for February 14th 2015 at 10:00 when we'll meet at a cross-roads near the village of Montieri (GR) for a guided walk themed "love in nature." A short distance of 3.5km through the woodlands of the Colline Metallifere. There will be a 'sweet' break in the countryside which will likely be much appreciated by children, so come as a family and spend an hour or two all together in the outdoors. Cost is 2 euros per person but children 15 and under are free! Bring binoculars, water, hiking boots, dress for the weather and bring a camera; you're bound to marvel at the views. La Riserva Naturale delle Cornate e Fosini insieme all’Associazione 75esima Avventura Natura e Sport Vi presenta una nuova iniziativa destinata a tutti coloro abbiano voglia di uscire di casa per avvicinarsi alla ricca natura che ci circonda. Vi organizzeremo passeggiate guidate, trekking, attività ed eventi programmati per conoscere meglio il mondo naturale delle Colline Metallifere. Il primo appuntamento programmato è per sabato 14 febbraio (fra 2 settimane!). Dettagli a breve. Potete passare un’ora o due insieme ai vostri figli ed amici all’aria aperta facendo attività motoria in tutta salute. Tutti gli studi fatti in materia ormai delineano i benefici mentali di trascorrere il tempo in ambienti naturali (effetto rigenerante, calmante, ci aiuta a concentrare, aumenta la creatività, felicità e tant’altro)...purtroppo una grande parte di noi passa sempre più tempo ad interagire con la tecnologia. Ci troviamo senza tempo da dedicare al nostro benessere, alla nostra famiglia ed al nostro ambiente. Eppure la soluzione è proprio ad un passo dalla porta… basta mettere una giacca e un paio di scarpe da trekking, uscire fuori e venire con noi! 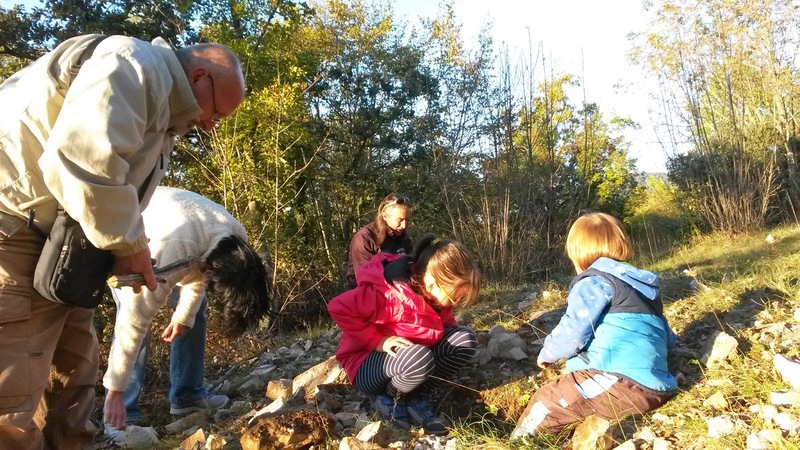 The Nature Reserve Cornate e Fosini together with the association 75 Avventura Nature & Sport presents a new initiative aimed at those who enjoy going outside and immersing themselves in the rich natural elements that surround us. We organize guided walks, hikes, activities and events all designed to bring you closer to the natural world of the Colline Metallifere in Tuscany. The first scheduled date is for Saturday February 14th (in 2 weeks!). Details soon to follow. It's an opportunity to spend an hour or two with your family and friends in the open air doing some healthy exercise. Studies continue to prove the health benefits associated with spending time with nature (it regenerates, calms, helps concentration, improves creativity, happiness and so much more)... still so many of us spend increasing amounts of time interacting with technology. We have trouble making time for our well-being, for our families and for our environment and yet the solution is just outside your door... just put on a jacket and pair of hiking boots, step outside and join us!